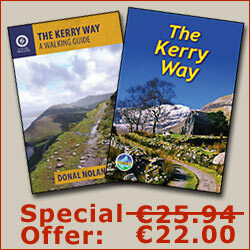 Approximately 100km of the central section of the Kerry Way is covered on Map 83. Similar to Maps 78 and 84, this latest revision was released in 2010 and printed to a scale of 1:50,000. 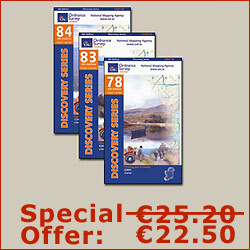 Map 83 picks up the Kerry Way from Kells and continues around the Iveragh Peninsula to the outskirts of Sneem. 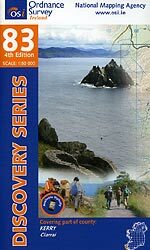 The large overlap with Map 84 which occurs includes around 70km of the Kerry Way from just after Mastergeehy to just before Sneem. Other popular attractions that appear on Map 83 are Valencia Island, an inset of the Skellig Islands. Lough Currane is another prominent feature as well as the popular pilgrimage mountain of Knocknadobar and also some of the Ring of Kerry Cycle Route.